I recently spent a glorious week in a tiny little hamlet south of Puerto Vallarta with my girlfriend, two good friends and my sister and her girlfriend. I want to share what I learned there so you can plan your own trip to a slice of paradise. Yelapa is a 45 minute water taxi ride south of Puerto Vallarta. See the red dot on the map below? That’s Yelapa. There are no cars in Yelapa. The road stops about 2km from the pueblo. The only way to get there is via water taxi. Pretty cool, right? Since there are no cars in Yelapa, they have to be creative with transport. Walking is the main form of transportation and the pueblo is easy to get around in, though the roads are a mix of dirt, concrete and cobblestone and the town is quite hilly too. Everything you want to do is within walking distance and no more than a 20-30 minute walk in any direction. You will also notice there are 4WD ATVs running around. For 50 pesos, you can have them take you pretty much anywhere in town. You will also see mules and horses. These are often used to transport goods around town. Be sure to give them right of way. There are no ATMs in Yelapa. There are a few places that will take credit cards, but will add a service fee up to 5% onto the price to use the card. We also found a few of the jewelry vendors on the playa also took cards. That was pretty much it. Because of this, cash is king in Yelapa. You will want to bring enough cash for your trip, or plan a day trip to Puerto Vallarta to go to a bank to get more money. Do not plan on being able to use your credit cards. And do not bring USD. You are in Mexico. You will need to pay with Mexican pesos. If you do have USD, you will be able to exchange the money around town but the rate is not very good. I also recommend making sure you have bills smaller than the 500 peso ones the ATMs dispense. It helps you be a better guest to the people in town. Cell service is spotty at best. Wifi is relatively fast, and most places have it but don’t have the password readily accessible so you need to ask for it. I use Verizon, and have their international plan that includes Mexico and Canada, so it was nice to have service when I could get it. Electricity can come and go. This is normal. It will come back on. Don’t be alarmed and be prepared with a flashlight or a candle or two. Speaking of flashlights, bring one. Or a headlamp. The streets are not well lit at night and you will need one to avoid stepping in horse poop or tripping on a stone. Life is much slower here. Food can take a while. Don’t worry about it. Good things come to those who wait. Take this time to speak with your friends or family who are with you and enjoy each other’s company. If you want to pay for your meal, you need to ask for the check by saying “la cuenta por favor”. They’ll bring it over and you can pay and go. Tipping of 10-15% on a meal is standard. If you venture out of the pueblo to the river area, be prepared for bugs and a jungle experience. Why? Because you are in the jungle! Bring some bug spray too. How do I get to Yelapa? Such a good question! I am going to share the way we got there with step by step instructions. I will also share some travel tips that helped us along the way. Please note, there are two ways to get there via water taxi. We went with what was easiest. You can google the other one. Get off your plane and follow the crowd to Immigration and Customs. Be sure you have the form they give you on the plane COMPLETELY filled out, including the bottom portion (I learned this the hard way). You will give this to the Customs person and need to hold onto the bottom part to give at departure. The first line is Immigration. This should go relatively quickly, and once you get your stamp, head on to baggage claim. I fly carryon only, so I immediately went to get into the Customs line. This one is a little bit longer. When you get to the front of the line, you’ll hand the form over to the Customs agent and then hit a button. If you get green, you go on through. If you get red, then you will have a secondary screening for organic material in your bag. They’re looking for anything that could allow foreign bugs to infiltrate their local flora and fauna. Leave those apples at home folks! Once you get through Customs, the fun begins! You will now be subject to a barrage of timeshare sales people. They will do everything in their power to get you to stop and talk to them. They will lie about where the taxis are, they will tell you it’s closed, whatever it takes to talk to get you to talk to them. Put your head down, do not make eye contact and do not stop until you round the corner to where the car rental places are. You are almost out! Round another corner and you are now into the arrivals area. If you bust a hard right, you will see a row of ATMs. Stop at the ATM and pull out as much money as you think you will need for your stay. Be sure to let your bank back home know you are going to be traveling so they don’t lock down your card. For one week and some some change I took out about 8000 pesos (approx $420 USD). This allowed me about a 1000 peso/day/person budget. This was more than enough for me. I was able to do about 500 peso/day which allowed me extras for souvenirs and other things we needed to buy. Please note: I did not drink alcohol on this trip, so if you choose to drink, your daily rate will go up accordingly. Once you have pulled out enough cash, walk out the door to the official taxi stand and tell them you want to go to “Playa de los Muertos pier” to get the water taxi to Yelapa. They know where this is and they will ask you if you want to pay in pesos or USD. They will give you a sheet of paper with the price (approx 344 pesos as of March 2019) and where you are going written down on it. Wait for them to get you a taxi. You will hold onto the piece of paper. As you are leaving the airport, you will hand over the piece of paper and pay the 344 pesos. Your driver will help make this go smoothly. The taxi driver will take you to the closest street to the Playa de los Muertos pier and you can leave him a tip of a couple of dollars (20-50 pesos is fine). Walk towards the pier and you will see two water taxi offices. The first is one on the left and just past them on the right is the second one. It doesn’t matter which one you use. You can go in and pay. It’s up to you whether you want to get a roundtrip or one way ticket. Roundtrip was 380 pesos. If you are there early, they will watch your luggage for you and you can go to a bank to get the large bills broken down into smaller bills or go grab a bite. The last water taxi leaves at 5p, so don’t miss it! When you get on the water taxi, there are some kids that will help with your bags. Let them do it and then tip them 20 pesos. Hand it to the kids. Don’t hand it to the adults. Take any help they offer for steadying you or grabbing a hand to help you get on the boat. Trust me. And take it slow and steady. You’ve made it on the boat! There will be two stops when you arrive in Yelapa. The first is at the hotel pier and the second is at the town pier. Depending on where you are staying, they will tell you which pier to get off of. And most places will have someone there with a wheelbarrow to help you with your luggage. Be sure to tip this person 20-50 pesos as well. I’ve arrived in Yelapa, now what? Well, first off….relax. No, seriously. This is the place to relax. There isn’t a whole lot to do here. That’s why you are here, right? Okay, have we taken a few deep breaths? Is all that tension in your neck going away? Good. Here are some suggestions of things to do. We ate at a lot of great places. These are the standouts. Ice cream, imported from Guadalajara and next to Tienda Yuri (I think that’s the name), usually open in the evenings. Look for the storefront that says “Helado” on it. If you want to cook, you can buy groceries at one of the tiendas and make your own breakfast or lunch. Honestly the food is cheap enough, I recommend at least eating one or two meals out a day. This is a small community that relies heavily on tourism, so share the love. All the places in town use filtered water for their ice and where you stay should also provide one of those big bottles of water for you to use. I do not recommend drinking the water out of the tap, though it’s fine for brushing teeth and showering. One of my favorite non-alcoholic beverages was either a limonada or a naranjada. MiraMar Excursions: We met Super Amigo while walking one day. Great guy and would totally go out with them. They have a lot of options and their prices are very competitive. You can book ahead or when you get to Yelapa. They also have places to stay, on their website or on Airbnb. Garcia Charters: We stayed in an Airbnb listing operated by the Garcia family. They also offer charters. They have more fishing options than other stuff, but I am sure could put something together for you if you asked. 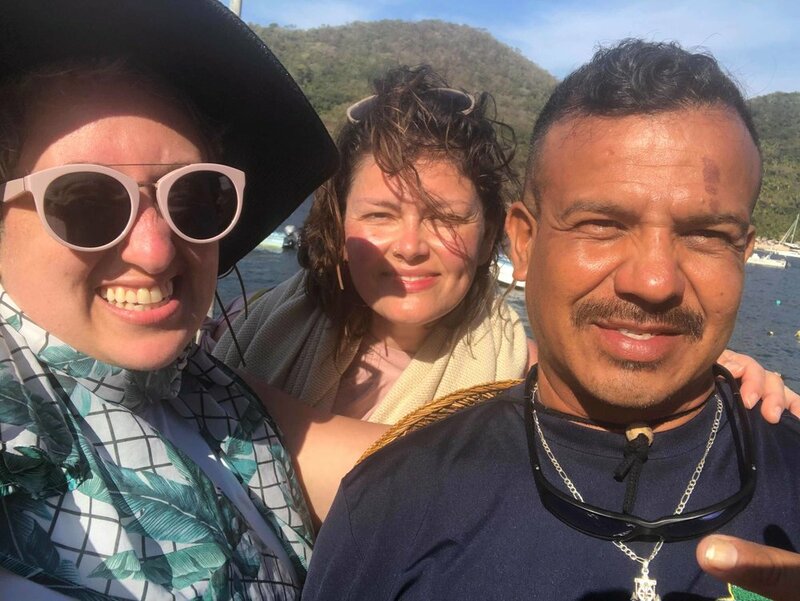 Ultimately, we ended up meeting a guy named Frankie at Fanny’s on the playa and he took us out for about 6 hours, which included snorkeling, hanging out on a private beach, eating lobster in Chimo and getting to experience life as a local. Cost was $60/person (not including lunch in Chimo or tip). If you want to give Frankie a try, ask around town for him and tell him Heather sent ya. Photo below, just in case you need a visual. tk, Lari and Frankie. Look for him in the pueblo or over at Fanny’s. We spent a few days on the playa. There are a whole row of restaurants there where you can order some food and lay out on their beach chairs under their umbrellas. You can also rent kayaks, SUPs and try your hand at parasailing. The playa is easily accessible from town, or you can also take a water taxi from the town pier to the playa. Unsure of cost as we never tried it. Also of note: the sandy area at the beach drops off quickly if you go wading out there. Be careful! The view from the playa. Not bad, right? There are two waterfalls. One is in town, and the other is about a two hour hike outside of town. Unfortunately, we did not make it to either of them due to one of our group members having some ankle issues. This is on our list for next time. Airbnb is a great option if you are looking for a place with a kitchen. We ended up at a Garcia Rental that was posted on Airbnb. I would also look at MiraMar and Garcia Rentals (both have their spaces listed on Airbnb too) if you want to have your own “home” for your stay. There are hotels in Yelapa if that’s your thing too. For the upscale (or special occasion), you could try Verana. Otherwise, Hotel Lagunita is a popular option. Casa Bahia Bonita is another option. Be sure to find out how many stairs you have to walk up and down to get to your place. Yelapa is quite hilly and most places are good about letting you know about stairs and how many there are to get where you are staying. You will most likely be right on the ocean, which is amazing for watching birds, iguanas, and other sea life (we saw crabs crawling around on rocks below our Airbnb!) and the views of all the boats in the bay every morning and night is something I always looked forward to. Word to the wise: you are right next to the ocean. As such, the ocean makes sounds. If you don’t like sounds of the ocean, maybe go stay at a resort with soundproof walls and windows instead. I actually read a review from someone who was disturbed by the sounds of the ocean! If you’d like to see more pictures from our trip, I posted the highlights on my Instagram account, @renegadpilgrim. Check it out! Please leave comments below and ask any questions! Hi friends. Not really sure anyone is reading this much anymore, but I am going to be resurrecting the blog. Two things are happening in my life that have precipitated the resurrection of the blog. One, I am preparing to go on a two month sabbatical from work. I want to share this adventure and will do so via the blog as well as my usual social media accounts. Two, I am working on becoming a Squarespace website developer, so what better way to work on those skills than to resurrect my blog. Expect to see some changes and expect to see more content in the coming months. I am also working at a way to monetize the blog, so expect to see some sponsored content in the future. That’s it for now. New blog post coming later today on my most recent trip to Yelapa in Jalisco, Mexico. I could have sat in this park for hours. It was so quiet and peaceful here. Today, believe it or not, did not rain! I walked with Al and we kept up a pretty good pace. It was definitely faster than I usually walk but we talked the whole way so it went fast. Al is a wee bit taller than me, plus he has his "Camino" legs after having already walked the Frances and onward to Finisterre and Muxia. He wasn't quite finished walking, so he took a train to Lisbon, then went to Fatima and started walking on the Camino Portuguese. We stopped after about 6-7km of walking at a cute bar. The owner was adorable. She had her compostela proudly on display, as well as other Camino-related items. After breakfast (OJ, cafe con leche and toast), we set off through a great track up and down a slight hill into Padron. We arrived at 12:50p, just before the albergue opened. While waiting for the albergue to open, we met another American, a woman from Florida named Teri. She was waiting for her "friend" Barbara to arrive. The albergue was pretty cool. It was a stone building with sturdy wooden bunk beds. It was very basic, but very functional. But it was also very cold. They assured us the heat would be turned on that night. Al and I left to go get lunch at one of the oldest buildings in Padron. I had a cheeseburger, which wasn't bad. We wandered a bit, went to the grocery store, then returned to the albergue to bad news. The power was out. This meant no hot water and no heat. I hadn't taken a shower yet, so this was definitely a problem for many of us in the albergue. In usual Spanish fashion, they couldn't give us a time-frame for when the power would be back on. They were stressing out about it because the municipal albergues have to meet certain standards and hot water is one of them. The two American women, Barbara and Teri decided they were going to find another place to stay. They found a room with three beds and invited me to join them for 20€. Even though the heat wasn't on there either (this is not uncommon in Spain), I had a scalding hot shower and plenty of blankets! I slept very well that night, even though my mind was on Santiago the next day. Morc made me a delightful breakfast of OJ, coffee, water, and bread with jam and butter. She also sent me on my way with some fresh roasted chestnuts to snack on as I walked. This woman is a saint in my book! I started back on the Camino with the intent to get to Caldas de Reis quickly because of the rain. At my first stop, I found a great place for breakfast--and lost my lead. Oh well. I ran into my Spanish amigos from Avila and walked with them until Caldas de Reis. At one point we abandoned the Camino because there was so much water on it. It was like we were walking in a small creek instead of a path. We ended up on the N-550 all the way into Caldas de Reis. Not ideal to be road walking and by feet were not happy. My Spanish friends were continuing on, so we said goodbye and exchanged emails. I was the second pilgrim to check in and finally met my first American, Al from Cleveland, OH. We went out for lunch of pimientos de Padron and a pork skewer plus a beer for me. It was delicious. After lunch, we both went to a china shop to get an umbrella for the rain. After two days of getting soaked, I had had enough. We both figured umbrellas would make the final two days of walking a little bit nicer...or at the very least a little bit drier. After lunch I was feeling really chilled and started shaking a bit. I got into my sleeping bag to warm up. Al and I had planned to go to Mass but he said I looked too comfy and maybe I should just stay in my bag. I agreed with him. At one point I started talking with a German guy who was walking the Camino Portuguese backwards and was trying to get to Morocco! I gave him the info I had on the coastal route, since he was interested. He was so excited he gave me a hug! Al and I closed the evening with hot chocolate, which hit the spot. I slept very well that night. I never grew tired of these views. When I woke up this morning, it was raining. Not a good sign. As the day progressed it went from a drizzle to a torrential downpour. At times, it was coming down sideways! I sought refuge at one point in a makeshift cafe with several pilgrims. A couple had converted their daylight basement into a bit of a cafe/tienda catering to pilgrims. It was a welcome respite. I met a doctor from Madrid and his wife, plus another couple from Avila. The French pilgrims I kept running into were also there. After a snack, I set off again and ended up walking with my new Spanish friends. Once we arrived in Pontevedra, I said goodbye. I continued walking to meet up with my Airbnb host. She was close to the historical area and the Camino. I am not sure of her real name, but her username was Morc (as was her little dog's name too!). She took me to her apartment, located in a former synagogue in what was once considered the Jewish area of the city. It was beautiful. Very serene and quiet. I was greeted with chant music, incense burning and a really nice vibe. I immediately shed my wet clothes and took a nice, hot shower. Morc served me lunch after my shower. She is a vegetarian, so she served me lentil soup, salad with greens (a rarity on the Camino, where salad is usually iceberg lettuce) and whole grain bread with hot tea. It was so delicious and very nutritious. I took a nap and a couple of hours later, went out to explore. Morc was so sweet and kind. She offered me her Camino boots so I could leave my shoes behind to dry by the woodstove. I couldn't resist her offer and her boots fit me perfectly. I went out for a bit, visiting some churches and doing my usual wander when I am in a new town. There is a church in the shape of a shell, but there were a lot of people in it, so I didn't stick around too long. I had some gelato and as I was walking there was a guy playing the Galician bagpipe. I decided to toss a few Euros in his hat and he played me a beautiful song. I am not sure what possessed me to give a street musician so much money, but it was totally worth it. I had a relatively uneventful dinner and went back to the apartment and fell asleep!